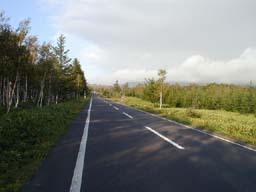 Roads in this part of Japan tend to be nice for cycling. Staying off the bigger highways, the smaller roads have few cars and often include wide smooth shoulders great for 2-wheelers. There are an array of wild animals here, including bears. 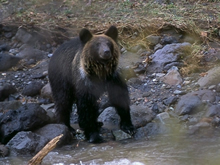 The bears are mostly found on Shiretoko peninsula, and for us we were able to spot them from a boat without risk. Hikers also may sometimes see them. Deer, by contrast, were very abundant and posed no danger. 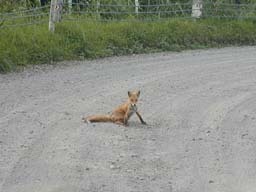 The northern fox. A few of these critters crossed paths with us, one of which we were able to capture on photo. 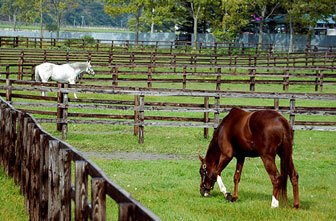 This region of Japan is well-known for its farms and we checked out a few of these as well. Good cycling? yes. Good food? absolutely. A few fine cycling roads lead us on up there. 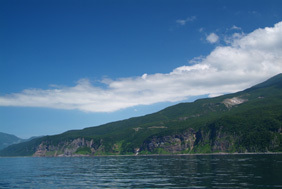 This one is near the coast, west of Abashiri. 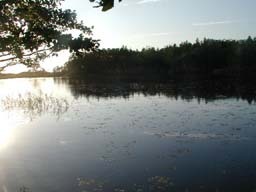 Lakes are also nice to visit this time of year - we didn't need bug spray in most places. The scale of terrain is different, we needed to keep it in mind when planning: we see a mountain and we can't just ride over to it right away. We didn't see many cars and the landscape is much more wide open than things around Tokyo. Convenience stores also aren't found as often. Especially if we're on a farm road much of the time. Think pace line for best results. More photos of the waterfronts on the tour. Scenic, but just larger in scale. 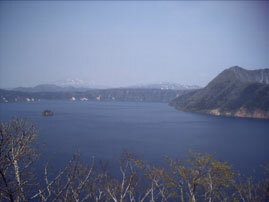 On the left is one of the big lakes, Masshu in Akan National Park. 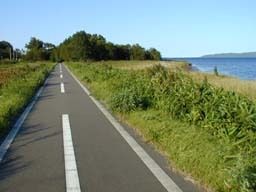 On right right, the Shiretoko coastline. Rides along these shores are rolling. We could not see lavender in September, or other of the summer flowers Hokkaido is famous for, but did see these. 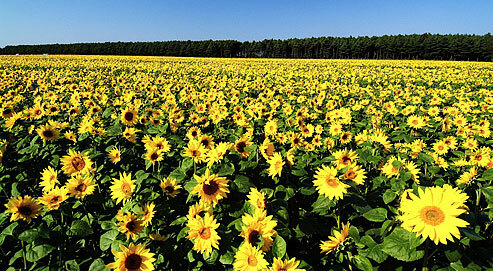 (Sunflower fields). 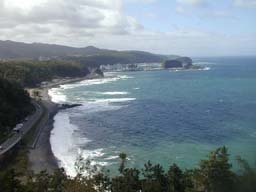 The Shiretoko coastline again, a main focus of this tour. World Heritage site - many interesting things to do along here. Sunset from Shiretoko (west) is just one of the great things. Numerous waterfalls along the route. This is one from Shiretoko Park. Covered Eastern Hokkaido as shown on the map above. Beginning a little to the upper left in the purple circle, which is west of Shiretoko. 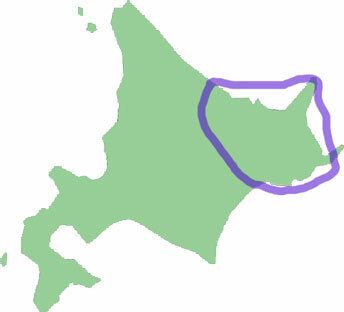 Ended on the coast south east of Shiretoko, bottom of the purple circle. Most of the roads in this area were good for us: big, few cars, decent condition. We stayed on cycling roads (no cars), farm roads, and off the main highways a lot. A lot of the roads are flat and open - these can get windy. Others are hilly. September 19 to 27 2009 is Platinum Week. This ride went from Sep 20, though some started on the 19th. It was Indian summer, still not cold, salmon running in the rivers, it's almost time for fall leaves so we saw a few at higher altitudes. キタキツネ - 動物園 -　牢屋 - 星 - 牧草地 - サーモン　パーク - 滝　- 自転車道　- 知床　- 道東. 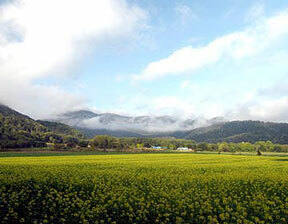 Scenery, fresh air, fresh food, and wildlife make this route memorable. Other highlights include the famous local sightseeing stops that are worth checking out: the farms, the National Parks of Shiretoko, Akan, and Kushiro Shitsugen, the zoo, the salmon park (autumn is spawning season for these fish), the lookout points, and the hot springs. Think airplane. Other ways are possible, but not if you're a little concerned about time. There are not many train routes in this part of Hokkaido. A lot of cycling and a rental car filled the gap. Indian summer in September. Still pretty warm. Highs above 20 C, but lows in the colder places in the morning, were below 10 C. Mostly in between 10 and 20. Typhoons are not expected. 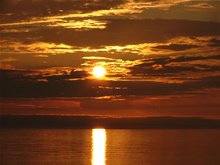 Sunshine is most typical. But over a 7-day period, normally expect a little rain. Some areas near the coasts get foggy. Not much wind for us, but it's possible. Early to bed. Sunset comes early in the north - 5:00pm was about the end of our riding each day, so we left extra early, before 7:30 am every day. The distance, speed and terrain required advanced fitness (not for beginners); not many bike shops on the way - we need to be our own mechanics and carry supplies (shared among the group); route requires paceline experience and equipment in good condition. The resulting peloton turned out to be Leo, Brian, Greg, Rob, Peter, and Sumie. Day 0 (20th) (start) 15km n/a Arrive. Famous zoo is here. Ride and take a train to our first hotel. Night 0: Good food to eat around this zoo. Hokkaido special farm dinner. Onsen. Location: Engaru (North King). Day 1 (21st) - first ride 120km 300 m Ocean, coast, cycling road, up to the forest lodge. Night 1: Forest dinner Location: Bihoro woodland. Night 2: lake food. onsen. Location: Kussharo-ko. Night 3: Park Hotel Dinner. sunset, onsen. Location: Utoro. Night 4: Fog Onsen Ryokan Seafood. East Shiretoko fog, onsen. Location: Rausu. Night 5: Hokkaido Seafood lots of stars on a clear night. Location: Naka-shibetsu. Day 7: Bike, Train and Home. 28km 100m homeward bound.